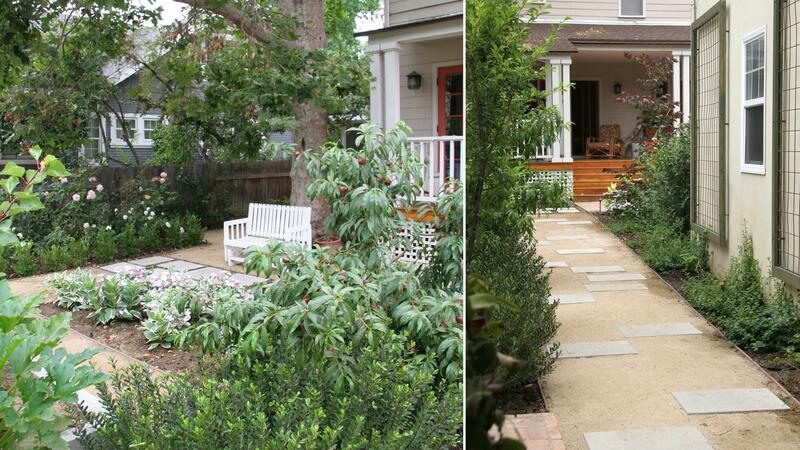 This little cottage garden belongs to one our South Pasadena Clients, and pairs with their quaint 1920’s Victorian home. Smaller and more romantic than some of the projects we’ve recently become noticed for, there really is something extraordinarily magical about this garden. Our Client came to us with what sounded like an ambitious vision, to one day never set foot in a produce market in that all of their fruit and vegetable needs could be harvested from their garden. The thing of it is, we’re not talking about a limited palette of standards here! Our Client’s son has a culinary background, and they host amazing seasonal soirées for many dozens of friends. We needed to literally create a “garden of all seasons” that would be manageable, decorative, and supply amply! 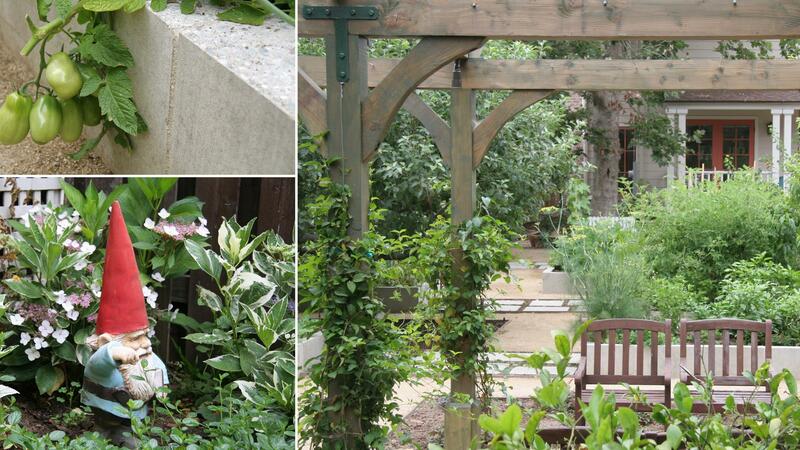 We wanted to give the garden a strong architectural context, and support it with simple strokes of ornamental planting. 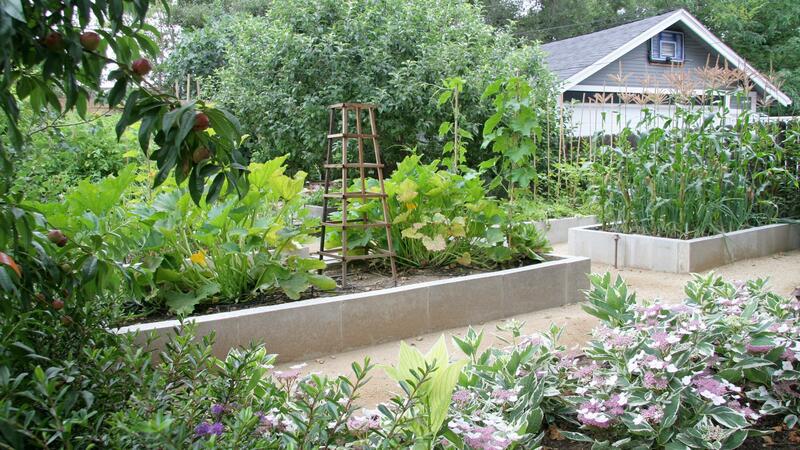 After all, we all know what fallow or unkempt veggie gardens look like right? That is not the case for this one! Our Client has the “greenest thumbs” of any of our Clients to date. In nine months, they’ve turned over 4 bountiful season’s worth of edibles. This garden is always vibrant. The site already had large producing fruit trees like: pomegranate, fig, apple, lemon, avocado, and plum. We introduced several more stone fruits trees in an allée down a prominent walkway centered on the house porch. The new garden yields thus far include: butternut squash, onions, potatoes, lettuce, cabbage, kale, spinach, tomatoes, herbs, zucchinis and other summer squash varieties, pumpkins, peppers, chilies, melons, corn, and non-edible loofah. Another fun note is that we created custom wall hung panels on the garage wall for hops to be grown. Keep an eye out for the “Monkey House” brew label! Patented by our Client last year, these amazing brews debuted at their annual winter holiday event and have been circulating around the Pasadena scene. CAT’S GAME! 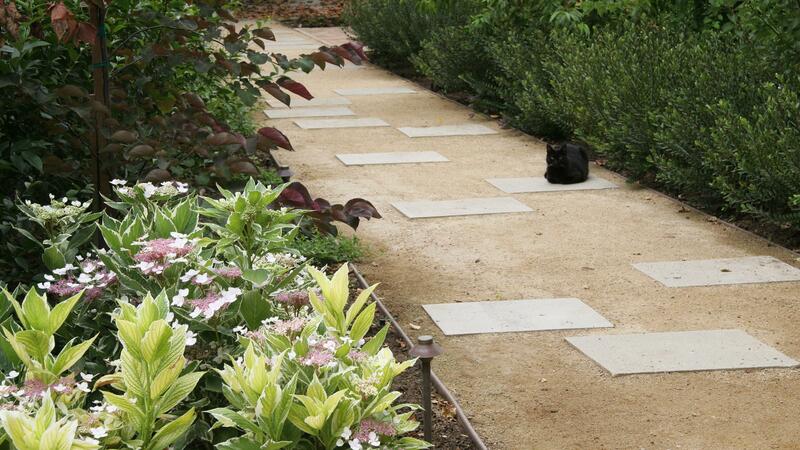 Just as this shot was taken, the family cat plopped itself precisely down on one of the pavers like a game piece. Funny enough, the vision for this paving layout was based on a deconstructed game board. This garden reclaimed an area of the rear yard that measures roughly 3000 square feet, half of which had been previously concreted over. What also makes interesting this garden, is that it is one of considerable “reuse” and economy. Over a three day period the former concrete slab had been saw cut into nearly five-hundred 12” x 18” rectangles that were repurposed as paving stones throughout the garden. Most were however acid washed and transformed into vertical walls in eight generously sized raised veggie beds. Each was provided with its own drip valve for watering convenience and easy regulating. Massed flowering ornamentals in the foreground draw from the palette of colorful garden edibles (plums, figs, apples, purple corn) to create continuity throughout the garden. We reused a pile of old bricks that had been stacked for years in the rear of the property. This became our under trellis sand set paving and also marked other nodes at various paths’ axes. We successfully replanted existing roses, a plum tree, lilac shrubs, and even a few camellias. The old claw foot tub had also been similarly waiting on site to be found for this project’s use. It makes a great ice bath to the brews during catered events. The new trellis was styled in keeping with the home’s exterior detailing. Four of its eight posts show wisteria vines being trained while four more are reserved for “lemon whips”. Incidentally, a “whip” is not kin to the “Orange Julius” beverage. Whips are specially grown un-branched trees that are vine-like.